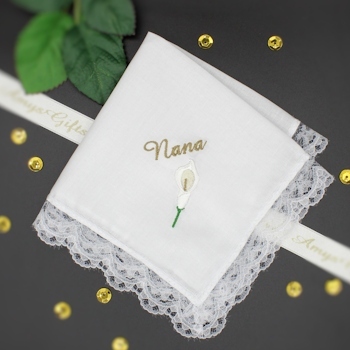 Lovely ladies lace trim personalised handkerchief featuring a embroidery of a cala lily flower. White cotton lace trim handkerchief embroidered with a Cala Lily flower and a name or initials personalised in your choice of thread colour. Just fill in the options boxes and choose what colour embroidery thread you would like us to use for the name. Just fill in the options boxes and choose what colour embroidery thread you would like us to use for the name. Choose the font style you prefer. Select from a single hanky or a gift set of 3 hankies. A pretty gift for a birthday, anniversary, Mothers day, special occasion or those who like to garden! Personalised Gifts are custom made to order - usually within 2 days.